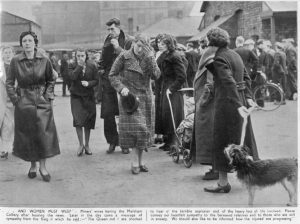 The men on the night shift went to work as usual on Monday 9th May 1938 not knowing that by the end of that ill fated shift more than two thirds of them would be dead or seriously injured. 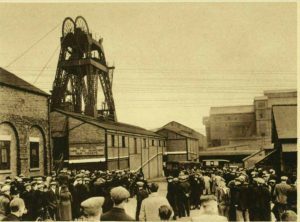 At 5.30 am the shift was coming to an end, some of the men had already started to make their way back to the pit bottom. This was the Black Shale seam, the deepest and the farthest away from the pit bottom – some one and a half miles. In the pit yard the men on the day shift were arriving ready to start work at 6am. Suddenly, underground, a tremendous draft got up followed by a terrific bang. Black coal dust and smoke filled the pit and a wall of fire swept through the seam. There had been an explosion of gas at the coal face. Some tubs carrying coal ran out of control and smashed into an electric joint box causing sparks which ignited the coal dust. 79 men were killed and 40 men were injured. Most of the men were married with young children. All 79 men were buried on Saturday, 14th May in 13 cemeteries. List of the 79 men killed. 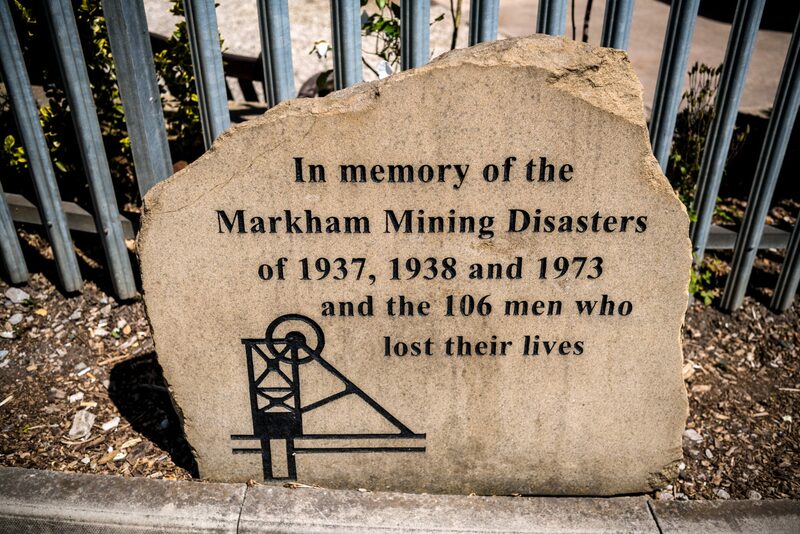 The funerals of the Markham Pit disaster victims took place on Saturday. The bereaved homes are scattered over a considerable area and arrangements were made for funerals to take place at different cemeteries. Especially deep sympathy has gone out to the families whose losses have been the heaviest. Mrs Herbert Hargreaves, of North Crescent, Duckmanton, lost her husband and two sons in the disaster. Mr. Emlen Grainger, of Clowne, lost two sons, and the widow of one of these mourns the death of a son as well as a husband. From midday onwards there was a constant procession of hearses, mourning carriages, and mourners on foot. 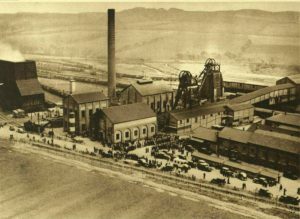 Twenty-one funerals took place at Staveley, 15 at Duckmanton, and ten each at Bolsover and Barlborough, seven in the Chesterfield district, five at Clowne, three each at Poolsbrook and Brimington, two at Hollingwood, one each at Mastin Moor and Carr Vale and one at Accrington in Lancashire. Sad scenes were witnessed in the packed streets, for 69 women had been widowed and 103 children left fatherless. Military honours were accorded Lance Sergt. W. Frost and Lance Cor. J.Hardy, of Staveley, who were in the Anti-aircraft Battalion of the Sherwood Foresters, and the body of George Jackson, was borne by Legionaires. The funeral expenses are being paid by the Staveley Coal and Iron Company. A massed service for 14 of the men was held at noon in Staveley Parish Church, and was attended by the Mayor of Chesterfield (All. Hatton), Mr. D.N. Turner (managing director, Staveley Company), Mr. H. H. Berresford (commercial manager), Councillor F. Wickins (chairman, Staveley U.D.C. ), Mr Miles Watts (Conservative agent), and others. At the cemetery several mourners, as well as members of the waiting crowd, had to receive attention from ambulance men. At unfortunate hitch arose in connection with arrangements for two military funerals, one from Poolsbrook and the other from Staveley, which should have synchronised at the cemetery at about 3.30 pm In the absence of coaches for the mourners at Poolsbrook the local Territorials sent an Army lorry and this was used to convey the coffin, private cars and vehicles from another funeral being used as conveyances. This occasioned some delay, and in the other case a service for two funerals in the Staveley Trinity Church was held up for half an hour awaiting the arrival of the military funeral party. Eventually this service proceeded, and it was not until 4.30 that the military funeral party arrived at the church. The delay caused some distress to a wedding party who reached the church before the dispersal of the last batch of mourners. The Salvation Army cap of Alfred Lamb, one of the victims, was buried with him. His 18-year-old widow, who is in a Chesterfield maternity home with her baby girl born 48 hours after her husband had been killed, said “No one else shall wear it.” Mrs. Lamb on Saturday received a gift for the baby from General Eva Booth, and a letter and 10s. note “from a mother” as well as numerous letters of sympathy. At the neighbouring village of Barlborough ten of the eleven victims were interred in one large grave, which was lined with ivy. They were:Rowe Kirk, Leonard Atkin, S. Lodge, Joseph Hibbard, Frank Smith, Bernard Gregory, George Davidson, Charles Bown, Harry Taylor and Colin Gee-Pemberton. The eleventh victim, Edward Salt, a colliery deputy, who resided at Poolsbrook, was buried earlier on Saturday in a grave adjoining that of his father (who was killed at the Crown colliery some years ago) in Barlborough churchyard. The Rev. G. W. Ready, vicar of Duckmanton, conducted the service. 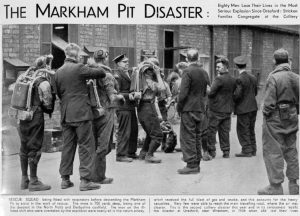 Bearers were provided by the Markham Colliery ambulance division, in charge of Sergt. F. Greaves, V.C. Fr. Gregson conducted the service for Leonard Atkin, who was a Roman Catholic, and Canon E. G. Walmsley officiated at the funeral of the other nine. After a service many of the grieved widows and relations broke down and had to be comforted and assisted by the men folk. Th funerals were those of D. Bann, G.C. Buckley, M. Richards and C. Silcock of Bolsover, W. Sherwin, G. Rowlands, R. Simms (Duckmanton), G. Cowley (Shuttlewood) and D. Whelpdale and J. Hadley (Stanfree). They were buried in separate graves. Canon J. E. Paget, conducted the one committal service. Councillor M. Stubbins, chairman of the Bolsover U.D.C, supervised the arrangements for the Bolsover district, and these were carried through with great efficiency. In a small farming village three miles from Bolsover the body of G.E. Pether, also a victim of the disaster, was laid to rest in the churchyard of Scarcliffe. The funeral service was conducted by Rev, C, H. Talmay, vicar of Scarcliffe. A large crowd of sympathetic people gathered to pay their last tributes and much sorrow was felt for the young widow, who is left in tragic circumstances with four tiny children.